We know, we know - the Nexus 4 is still awfully hard to come by. If you haven't already rushed to your nearest Best Buy, you might want to run over to WireFly, where T-Mobile's version of the N4 is just $149.99. 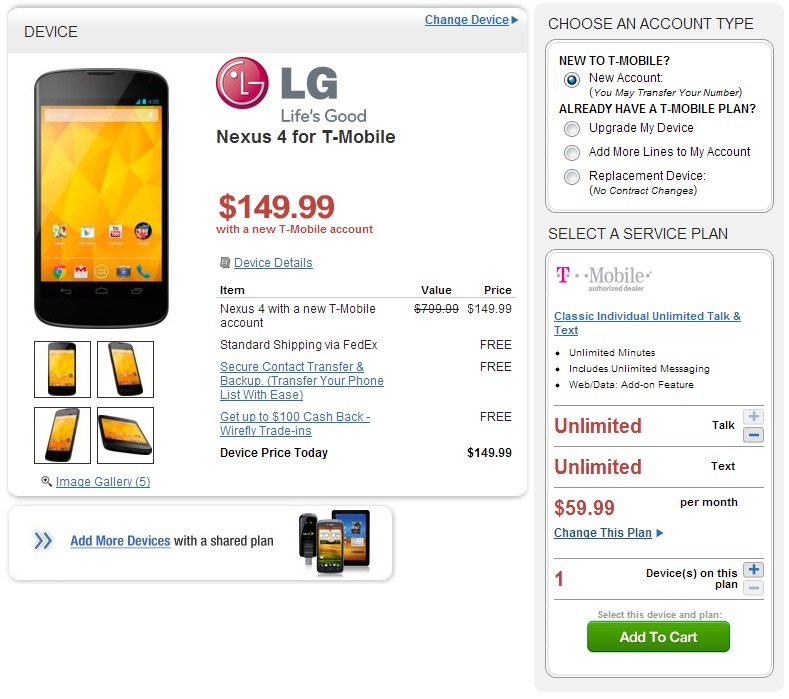 That's $50 less than T-Mobile's retail price, and the lowest we've ever seen for the 8GB model. The deal is good both for new contracts and 2-year renewals. FedEx shipping is free. Of course, that contract means that this still isn't practical for those who want an unlocked model. If you're hoping to avoid signing on the dotted line, your best bet is still to wait out Google and LG's current supply issues. But if you're already on T-Mobile and intend to upgrade anyway, or you're willing to jump ship, it's a deal that can't be beaten at the moment. You will have to stomach a $35 T-Mobile activation charge, but you'll have that anywhere, and and at least this one's cheap and available. Hurry up and jump on this one, Nexus fans. With the US supply of Nexus 4s continuing low, there's no telling how long Wirefly will be able to keep them in stock.